A record field of 28 met to dispute the title in GMT's American Revolutionary War series. 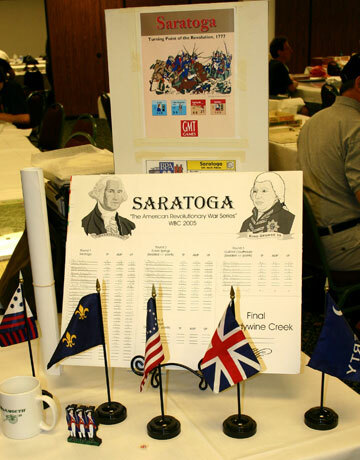 In the first round, 14 pairs fought the battle of Saratoga where the British players achieved 10 victories. Nine of those victories were marginal, including a half-pt. nail biter in which Tommy Miklos (age 12) defeated Rod Coffey. Only James Miller's British won a substantial victory by defeating Rob McCracken's Americans. While the American side only won four of the contests, both Bruno Sinigaglio and Derek Miller managed substantial victories over their British opponents. Twelve players continued in the second round to fight the battle of Eutaw Springs. Joe Doughan's British won a substantial victory over James Terry while James Miller's British won a marginal victory over Bill Alderman. Three pairs of players fought Eutaw Springs to a draw. Meanwhile, Dale Long and John Vasilakos opted to play Saratoga again as the default game.Vasilakos' British defeated Long, last year's runner-up, with a marginal win. Nine players continued into the third round with the bye going to last year's champion, Mark Miklos. The game was Guilford Courthouse where, unlike past years, the campaign scenario rather than the historical scenario was used. In Guilford a draw was scored as an American marginal victory and that's how three of the four matches were resolved. Only John Miklos (age 13) prevailed as the British with a marginal win over Tony Curtis. John Vasilakos withdrew from the competition to take on Assistant GM duties elsewhere which returned the field to an even four players for the semifinal which was once again, Saratoga. Oddly, while the early rounds of Saratoga seemed to favor the British, both semifinals were American victories. Bruno Sinigaglio defeated John Miklos 7 to 0 with an Army Morale differential of +9 while Mark Miklos defeated Derek Miller 7 to 0 with an Army Morale differential of +14. This left John Miklos in 3rd place and set up a final between Bruno and Mark across the banks of Brandywine Creek. Regrettably, the clash of titans was not to occur. Bruno felt compelled to withdraw in order to fulfill his GM duties in the semifinals and finals of Bulge 81' and Anzio. As a gentleman he did not want to subject his opponent to the distraction of interrupted play and no amount of persuasion could change his mind. In the end, Miklos was left unchallenged in 1st place. While he was happy to three-peat as Saratoga champion it was bitter sweet.